The Peterson property was purchased in 1941 and was destined to become The Santa Cruz County Fairgrounds. The first fair opened on October 16, 1941, and included a horse show, plenty of agricultural exhibits and special entertainment features. That same fateful year the attack on Pearl Harbor threw us into a war. It wasn’t until 1944 that the fair began again. In 1948, the Board of Directors presented an historical pageant at the fairgrounds horse show arena called The Cavalcade of California, and was held from September 30, to October 1, 1944. The horse show arenas were used for rodeos, ropings and various horse related activities. In 1972, the RCA Championship Rodeo was held in Oct and was sponsored by The Santa Cruz County Sheriffs Posse. In 1973, Frank Alden was quoted as saying, “We should promote and cater to horse shows,” because it involves less headaches and more revenues. Horse show improvements were then slated for the coming year. In 1973, 30 horse shows were held. In January 1983, Chuck Wagon races were held, 120 horses and 30 wagons participated. About half dozen of Canada’s top drivers made camp at the fairgrounds. That year the American Paint Horse Show took place. More than 200 paint horses were put through their paces. Today our rich history of horseshows lives on. 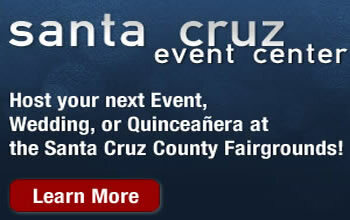 The Santa Cruz County Fairgrounds is home to 30 shows per year and hosts every type of horse event. If you are interested in finding out more about how you can host your next event in one of our three arenas please contact us at 831.724.5671 or send an email to .